The temperature of 16°C at Ottawa also smashes the record of 12.4°C in 1986. Toronto's period of record (1938-2009) is somewhat shorter, but today's high temperature of 18°C was just short of the record 18.9°C. in 1966. Tomorrow's forecast high temperature of 18°C, if it occurs, will easily break the record of 14.2°C set on March 19, 1986. Several Canadian locations set records on March 17 (Canada basks in record high temperatures). Records were set in Montreal, Ottawa, and Halifax as well as in places as far apart as Manitoba and New Brunswick. So far, March has been the warmest on record in many places following a very warm winter. Note that Sault Ste. Marie has set 5 records in the last 7 days. Only 2 days in February were below average, and none in March. The last 8 consecutive days have each been at least 20° above average. The monthly average for March through the 17th is an amazing 16.7° above average. The long-term average for this time of year is a low of 15 and a high of 32. Records began at Sault Ste. Marie in 1888. 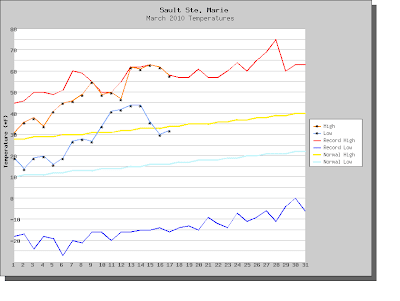 Caribou has also had only 2 days below average since Feb. 1. Every day except one from Feb. 8 through March 8 was at least 10° above average. February overall averaged 10.7° above average, and March is continuing to average the same amount of warmth. The churn in the local broadcasting market fed by falling revenues has brought another new face to Washington weathercasting. Following the recent departure of veteran meteorologist Bob Ryan, the 11 pm report on WRC-TV, Channel 4, last night was delivered by Justin Drabick. Drabick's presentation showed a familiarity with local geography undoubtedly acquired during an early career spent on Maryland's Eastern Shore. After graduation in 2004 from Millersville University, he spent 5 years at WMDT, Channel 47, the ABC affiliate in Salisbury. In December, he moved to WBOC, the Salisbury CBS/Fox affiliate broadcasting on channels 16 and 21. Drabick holds a Certified Broadcast Meteorologist seal from the American Meteorological Society. The National Climatic Data Center (NCDC) preliminary analysis, posted last week, shows that U.S. February 2010 average temperatures were the 29th coldest out of 116 years of records. Meteorological winter (December 2009-February 2010) was the 18th coldest. In the Mid Atlantic region, both Maryland and Virginia had their 20th coldest February. Delaware had its 23rd coldest, and it was the 16th coldest for West Virginia.